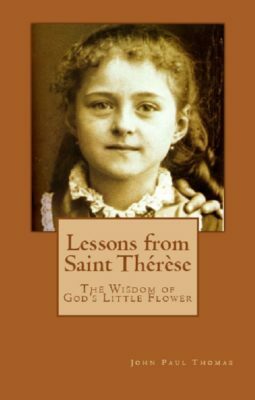 Lesson: When Thérèse was eight years old, she went to school at the Benedictine Abbey of Lisieux. She was one of the youngest girls there but also one of the brightest. As a result, she would often be teased and mistreated. Naturally timid and sensitive, I did not know how to defend myself, and could only cry in silence. Céline and my elder sisters did not know of my grief, and, not being advanced enough in virtue to rise above these troubles, I suffered considerably. The only way that Thérèse could deal with this difficulty at school was to take refuge at home every evening. There, she found the love she needed to lift her spirits and to endure the difficulties she faced at school. Indeed, to be spoilt was a real necessity for me. The Little Flower had need to strike its tender roots deeper and deeper into the dearly loved garden of home, for nowhere else could it find the nourishment it required. Her home was her refuge. As she grew and matured as a child, she allowed the love she received from her father and sisters to help her face the teasing she endured at school. Reflection: We all need a place of refuge. Some will encounter similar difficulties as a child, and all of us, no matter our age or circumstance in life, will face various obstacles and sufferings. No matter the cause of our daily sufferings, and no matter the magnitude, we all need to discover the place of refuge where God can minister to our needs. What is it in life that you endure, perhaps even on a daily basis, that causes you grief, sorrow or confusion? Perhaps you regularly experience some form of mistreatment as Thérèse did. Or perhaps you suffer from abuse to an even greater degree. Look honestly at what causes the most difficulty in life and know that, even if it continues, God wants to offer you a place of refuge. Prayer, be it at church or in the solitude of your home, is one of the greatest places of refuge and consolation. Family and friends also often offer us a place for healing, clarity of mind and love. Allow God to minister to you so that, like Thérèse, you will be able to daily sink the tender roots of your soul into the garden of God’s love. Dearest Saint Thérèse, your home was your refuge and garden of love. It was there that you found rich soil to nourish you as you encountered the ordinary sufferings of life. Pray for me, that I may also find the “garden” God gives me in which I can be nourished by the tender love and mercy of God. Saint Thérèse, pray for us. Lesson: Most children have wonderful imaginations and can spend hours playing and pretending to be someone they admire or hope to become. They may play house, imagining themselves to be parents, or, as it was with Thérèse and her cousin Marie Guérin, they regularly imagined themselves being religious hermits, seeking deep holiness of life. Healthy imagination can easily inspire and motivate us toward the good and toward a life of virtue. It can also teach us many lessons in life as we ponder various mysteries of the lives of those we dream about. As Thérèse and Marie imagined themselves being austere hermits, living lives of prayer, solitude, poverty and penance, their little minds were formed and they daily engaged the mysteries of this holy vocation with fun and excitement. Reflection: Perhaps you no longer spend time playing as a child does, but most people regularly find themselves in an imaginative world, daydreaming about greater things. What is it that you daydream about? Some will find that they daydream about worldly endeavors: riches, popularity, success and the like. Others may daydream about less enjoyable activities such as revenge for a hurt received. Your imagination is important and is often the “playground” of the evil one. But it can also be the playground for the Holy Spirit to teach you and form you in holiness. Reflect, today, upon all your usual daily reflections. Know that the imagination is a powerful tool that greatly influences you. Therefore, try to conform your daydreams only to a life of holiness in imitation of the saints. Allow the Holy Spirit to take over your imagination and to teach you many holy lessons, inspiring you to act in virtue and grace. Dearest Saint Thérèse, like any ordinary little girl, you engaged in daily fun and play. You allowed your imagination to draw you into games imitating the holy hermits and into a life of virtue. Pray for me, that I may guard my imagination from the evil one and allow only God to inspire me so as to use this gift of reflection to grow into the saint I am called to become. Saint Thérèse, pray for us. Lesson Twenty-Nine — The Greatest Day is Today! Lesson: When Céline was eleven, she began her preparation for First Holy Communion. At the time, Thérèse was only seven and would not be able to make her First Holy Communion for four more years. In the final weeks prior to Céline’s receiving our Lord in the precious Sacrament, she vigorously prepared for this grace. Every evening her older sisters would sit her down and teach her about this special gift from God. One evening, as Thérèse listened on from a distance, she heard someone tell her sister, “From the time of your First Communion you must begin an entirely new life.” That was all Thérèse needed to hear. From that moment on, she decided that she would not wait for her own First Communion to “begin an entirely new life.” She decided that she would make that choice on the day Céline made her First Communion. Very often in life we resolve that we will do this or that in the future. We decide to change with promises that are never fulfilled. One key to fulfilling our resolutions is to do them now, today, and not wait for some future date. When Thérèse watched Céline make her First Communion, Thérèse indeed made that a moment of conversion in her own life. She recalls that it was one of the most beautiful days of her life. She did not hesitate; she did not wait. Reflection: What is it that you find yourself putting off until tomorrow? What change is God asking of you that you hesitate about? Reflect upon these words of wisdom that Thérèse overheard as Céline was being prepared for Holy Communion: “You must begin an entirely new life.” If you have already received Holy Communion, and regularly do receive this precious gift, then today is the day! As you ponder this question, think about what comes to mind regarding your need to change. Whatever comes to mind first, that is most likely the area of your life God wants you to surrender to Him. Do not hesitate. Resolve today, and again tomorrow and again each day of your life. Continually seek to make this day the beginning of an “entirely new life,” and God will lead you down a most glorious and beautiful path. Dearest Saint Thérèse, you did not wait to give your whole life to God. You seized every opportunity to begin again and to surrender all. Pray for me, that I may also begin anew today and every day of my life. May every day be as my First Communion. May God receive the gift of my life and lead me down the path He desires. Saint Thérèse, pray for us. In the afternoon of that October day, 1882, behind the grating of the Carmel, I saw my beloved Pauline, now become Sister Agnes of Jesus. Oh, how much I suffered in that parlour! At that time I did not know the joy of sacrifice; I was weak—so weak that I look on it as a great grace that I was able to bear such a trial, one seemingly so much beyond my strength—and yet live. Prior to Pauline’s entrance into Carmel, Thérèse discerned that she also was being called by God to join her sister as a Carmelite nun. Pauline arranged for her to speak to the Reverend Mother about this and, though she was sympathetic to her desire, she informed Thérèse that she would also have to wait until she was sixteen years old, which was seven years away! Pauline entered Carmel in answer to the call of God in her life. It was her fidelity to this calling which also offered Thérèse the opportunity to make the sacrifice of her new mother to God. Because Thérèse loved Pauline so deeply, the sacrifice she was called to make was also very deep. But the deeper the love, the more powerful the sacrifice. Reflection: What is God calling you to offer Him as a sacrifice of love? Do not be disillusioned into thinking that the will of God is always paved with a bed of roses. At its heart, love is sacrificial. It requires death to our own will and, at times, it requires we let go of all earthly attachments, even attachments that are pure and holy, such as the love shared by Thérèse and Pauline. Ponder those circumstances in your life to which it is difficult to say “Yes.” As you see the sacrifices God wants of you, do not be deterred from your “Yes” on account of the sacrifice involved. Know that Jesus paved the way by laying down His life in the ultimate and unlimited Sacrifice of Love. He also calls us to do the same. Dearest Saint Thérèse, you felt the pain of the sacrifice God was asking of you when He called your beloved second mother and dear sister, Pauline, to enter into the walls of Carmel. Your suffering was on account of your love and that God asked much of you. Pray for me, that I may love so deeply that God asks me for the ultimate sacrifice of my life. May I imitate the perfect “Yes” of our Blessed Mother and Jesus Himself by the help of your prayers. Saint Thérèse, pray for us. Lesson Thirty-One — Our Lady of Victories! Lesson: Thérèse’s pain at the departure of her dear Pauline to Carmel was so great that she became seriously ill. 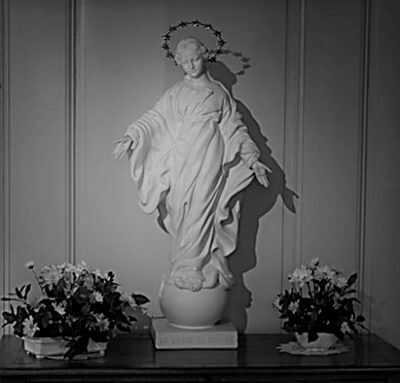 It was as if the evil one was furious at Pauline’s entrance into Carmel and did not want Thérèse to follow her. Physical manifestations of her pain started one day when she was with her aunt and uncle. Thérèse began to shake and experience tremors, and there was little that could be done. The family doctor could not give a diagnosis, but another doctor stated that Thérèse was experiencing serious neurological episodes on account of her extreme emotional distress. As the illness went on for months, her family was very concerned. Pauline wrote her many letters from Carmel, her father did all he could for her and her sisters were always at her side. At times she was delirious, at times unresponsive and at times she would temporarily recover. Suddenly the statue seemed to come to life and grow beautiful, with a divine beauty that I shall never find words to describe. The expression of Our Lady’s face was ineffably sweet, tender, and compassionate; but what touched me to the very depths of my soul was her gracious smile. Then, all my pain vanished, two big tears started to my eyes and fell silently. My first visit there after my illness was full of joy at seeing Pauline clothed in the habit of Our Lady of Carmel. It was a happy time for us both, we had so much to say, we had both suffered so much. My heart was so full that I could hardly speak. Thérèse no longer felt as though Pauline was lost to her. Our Lady cured her of this deep sorrow and began to prepare her for the wonderful journey ahead as she would soon enter Carmel herself. Reflection: Have you ever allowed your emotions to overwhelm you to the point that you became ill as a result? Even if you have not experienced physical illness, you most likely have felt the ill effects of emotional distress, anxiety and the like. Reflect upon the fact that God wants to free you from the anxieties of life. Our emotions are a powerful gift from God. They can be used for much love and can become a source of great devotion and drive in life. However, when they are not properly ordered, they can cause us many difficulties. Reflect upon your emotions and distresses this day. Offer them to our Blessed Mother and trust in her intercession. Even the greatest saints, like little Thérèse, need the intercession of our Lady of Victories in their lives. Dearest Saint Thérèse, you loved your sister Pauline with such a love that her departure was too much to bear. But the love of your family and the intercession of Our Lady of Victories brought you joy and healing. Pray for me, that the pains and sorrows I feel in life will be healed by God so that I may embrace His holy will with much joy. Saint Thérèse, pray for us.